In our era of hyper consumption, we distinguish ourselves from others by our ideas and what we represent. What we choose to consume ultimately defines who we are. With developments in media and tech, expressing who you are becomes a daily ritual, thereby creating an almost inherent need for innovative forms of expression. We want to engage with brands that project character, and that allows us to connect with their values and creative vision. The greatest expression of a brand's "personality" is shown in the art of exhibiting their work, the most potent example of which in fashion is a Runway Show. These shows have slowly transitioned from pure garment presentation, to fully fledged immersive experiences where the designer pairs their aesthetic with a fabricated atmosphere in order to teleport their audience into a cuarted realm. A brand which pioneered this excessive mode of presentation is Chanel; season after season the audience is rendered in awe of the magnificent sets created in the Grand Palais. For each show Karl Lagerfeld envisions the world through the brand’s philosophies: classy, modern and luxurious. In FW14, the audience was astonished by the fully-functioning Chanel branded supermarket, in which Karl Lagerfeld spared no detail; stocking fresh produce, shopping baskets and even a hardware section filled with Chanel brooms and hammers. Then in FW17, he launched a marvelous space station featuring a Chanel rocket, which quite literally blasted off during the finale. As Gabrielle Chanel was in touch with her time, Karl Lagerfeld is as well, creating theatrical spectacles reflective of the moment, such as the SS15 RTW Chanel Revolution. In which the Grand Palais was transformed into a Parisian boulevard, which hosted a feminist protest inside it. For the finale, models marched down the catwalk together carrying signs that screamed slogans such as “Ladies First”, “Women’s Rights Are More Than Alright” and “History Is Her Story.” During the SS11 RTW show, Lagerfeld commissioned an orchestra of 80 musicians to play live music at the show. 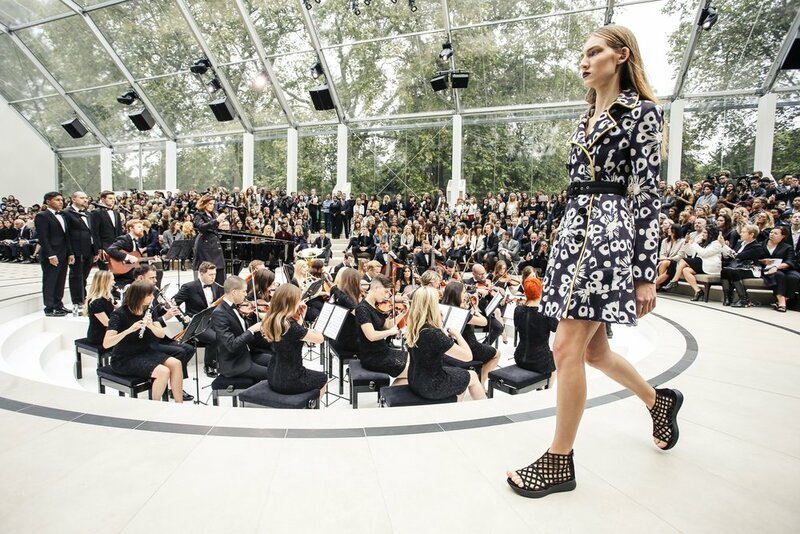 On this musical note, many other brands have mixed fashion and music, notably Burberry during their Spring 2016 RTW show, which hosted a 32-piece orchestra arranged as a circular pit and in its center, the singer Alison Moyet. This musical collaboration aims to highlight the brand’s interest and support of the music industry, as the show took place just a week before the launch of an Apple Music channel which featured playlists and music videos curated by Burberry, an innovative move for such an iconic luxury label. Collaborations between artists and brands have been at the crux of hype culture in recent years, however they are not exclusive to product design, many creative directors choose to collaborate with multimedia artists for their set design as well, such as Raf Simons and Sterling Ruby for Calvin Klein’s FW 2018, where Ruby created an American prairie in an apocalyptic future, presenting four run down barns, and an ankle-deep carpet of popcorn. Christopher Bailey’s last show for Burberry was a collaboration between the brand and London-based studio United Visual Artists for a striking art installation in support of the LGBTQ+ community. The collection was presented inside two different light displays. The first was a “a multi-sensory immersive installation piece” and the second is a “3,000 lights emitting rainbow-coloured architectural formation,” as UVA explained to creative zine Dezeen. Delving further into the art of installation and runway design, it becomes apparent that fashion shows are less about the clothes and more about orchestrating a full blown theatrical experience. Mixing fashion and dance was the theme in Rick Owens’s 2014 spring show, where his collection was presented by groups of stepping teams from America, the forty dancers presented a thrilling spectacle highlighting very powerful political and cultural statements on race and gender, it was true performance art, not a fashion show. Known for his innovative mind, Marc Jacobs’s SS15 show transported his guests into an alternative reality. 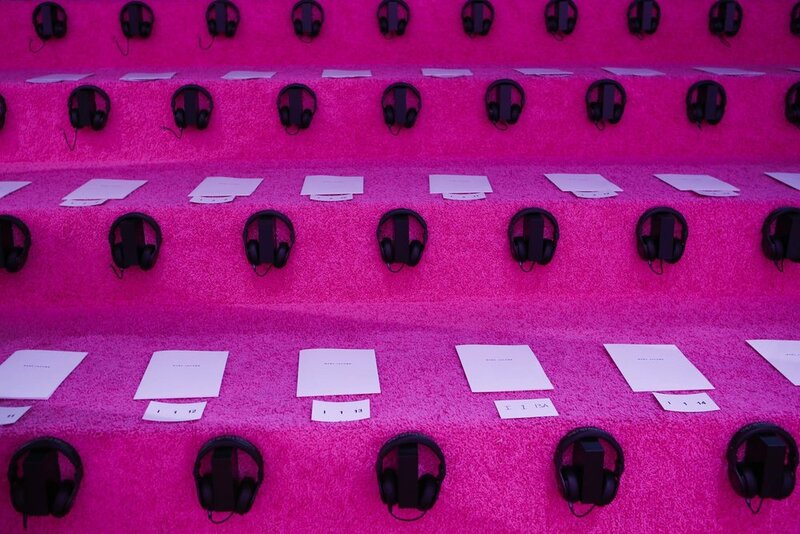 Each guest wore a Beats by Dr. Dre headphones set, with which they listened to storytelling narration while models pounded the catwalk. However, the main attraction was arguably the hot pink choice of color décor, with a massive pink house built at the centre of the runway. This architectural piece blocked opposing guests from viewing each other and forcing them to focus on absorbing the show. Fashion spectacles were, to this day, best depicted by the late Alexander McQueen, a renowned showman and creative genius. Every McQueen show was a performance. In FW06, he had a life-sized ethereal hologram of Kate Moss in a ruffled gown appear at the centre of a glass pyramid on the runway. In his Spring 1999 show, model Shalom Harlow spun on a circular platform, in a strapless white dress while robots, which were typically used to paint cars, sprayed her in a carefully choreographed dance. These potent artistic creations ultimately had all the guests moved, sparking McQueen's shift from a fashion label to a hub of creative innovation. Art, fashion, music, dance, and tech have all converged into creating overwhelmingly sensory adaptations of exhibition design. A runway show is just one form, a spectacle that allows for clothing to take center stage while simultaneously giving the audience a show to remember. After all, runway is about extravagance and fashion is rooted in showmanship. We wear the things we do, to show people who we are without having to say a word. Sometimes, the runway spectacle of our own lives is theatrical enough to inspire moments of transcendence. Softer than a Monet, more complicated than Pollock. Somewhere between couture and streetwear.